The Amazon marketplace is a highly competitive marketplace to sell your products in, but it's also a reliable sales channel due to the large number of customers Amazon acquires and retains every year. As a seller on Amazon, you might be wondering how you can step up your marketing efforts to drive more external traffic to your Amazon product listings and grow your sales. Promoting your Amazon store does not have to be limited to internal promotion methods such as Sponsored Ads. 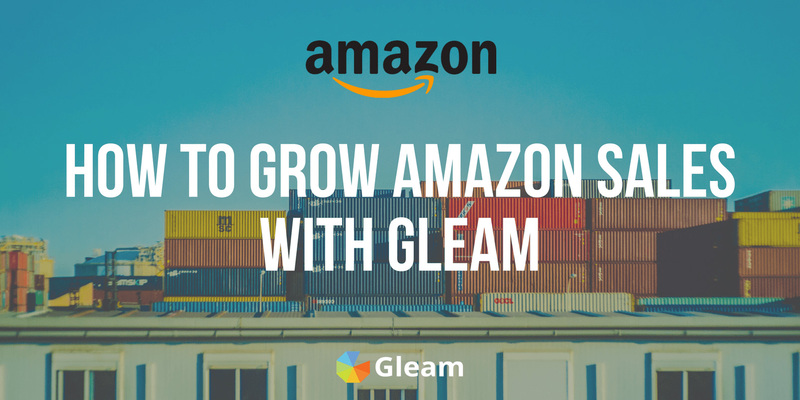 Using creative methods with Gleam's suite of products, you can promote your Amazon product listings externally, engage with your customers and also drive sales. As an E-commerce business you have undoubtedly run sales promotions for your products by giving away discounts or coupon codes. Whether it's to increase short-term sales or to get old stock out and moving, discounts are a great way to attract new customers and also encourage return customers to make a purchase. 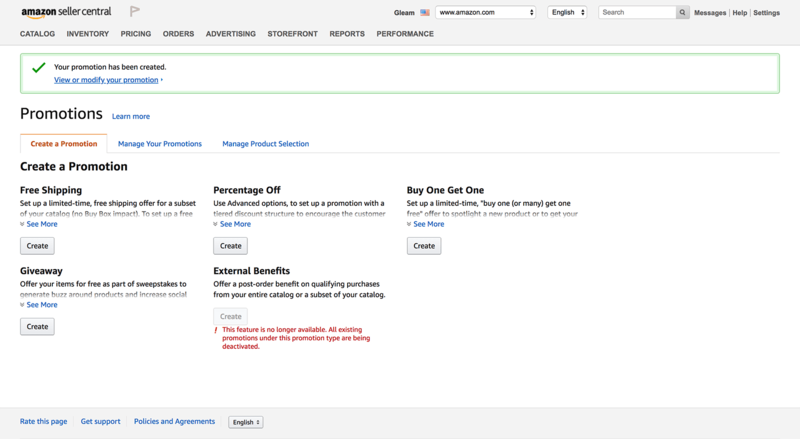 Amazon's Seller Central allows sellers to run a variety of promotions depending on the seller's needs. In this guide we will cover the Percentage Off and Social Media Promo Code promotions. You can use Gleam to distribute these promotions. Before creating your promotion, you will need to create a product selection. Once you're done creating a Product Selection just head back to the Promotions tab and create a Percentage-Off promotion. A claim code is Amazon's version of a 'promotional code' that can be distributed to consumers in order to redeem a specific promotion. Percentage-Off promotions are distributed via a single-use or group claim code. A single-use claim code is a code that can only be redeemed once, meaning once a customer has redeemed the claim code, it will no longer work for the next customer. A group claim code is a single code that is distributed to a pool of people who will all be able to redeem your promotion using that same code. Claim codes are not to be confused with Amazon Coupons which are a different kind of Advertising method meant to drive internal traffic. Social Media Promo Code promotions need not be redeemed using a claim code. It is a percentage-based discount distributed via a unique link which will bring the user to the promotion's landing page on Amazon. Once the user is on this page, they can add your product to their shopping cart and the discount will automatically be applied. According to Amazon, this promotion method is great for driving external traffic to your product listings. For more information on creating a Social Media Promo Code promotion, refer to Amazon's documentation. 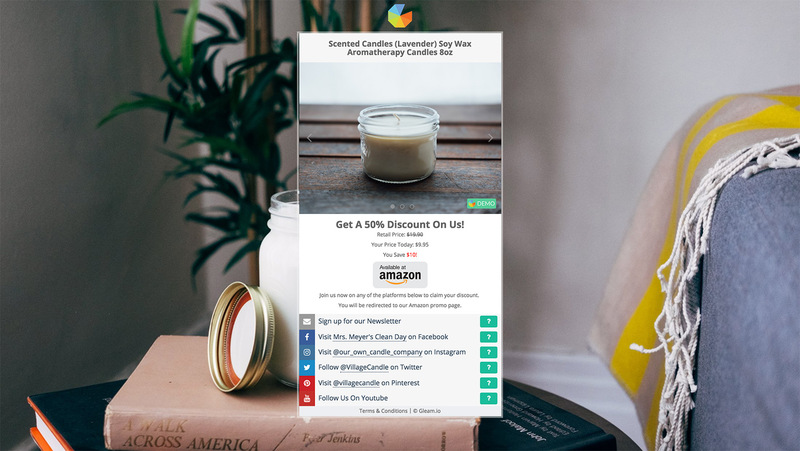 Be default, Social Media Promo Code promotions are shared on Amazon's Associate Central where associates or influencers can pick a relevant promotion to create content for. If you would prefer not to disclose your promotion to Amazon's associates or influencers, remember to opt out when you are creating the promotion. For more information, visit Amazon's documentation. Once you are done creating your promotion, you will need to export the claim codes and enter them into your Gleam campaign in order to distribute it to your audience. Follow the instructions in Create claim code group and then click on Create. When the Status column changes from In Progress to Ready, click on Download to retrieve your claim codes. You will need this .txt file later to copy and paste your claim codes into Gleam. As a business owner, we know the pain of juggling between making a profit and the cost of customer acquisition - running discounts at the expense of your own profit margins can be highly challenging for the growth of your business. Gleam Rewards can help you incentivise your discounts to grow your social following, drive more traffic to your web store and encourage higher engagement with your customers. This makes running a promotion worthwhile for the long-term growth of your business. Using Gleam Rewards you're free to create any action you like by using your promotion as an incentive. That means if your audience wants to redeem your discount, they will need to complete certain actions to unlock the claim code. A good thing about using a widget like Rewards is that you can control the traffic that visits your Amazon product listings - meaning only qualified leads that have performed your desired actions will access your promotion or your product listings, thus boosting your conversion rates. A very basic campaign you can start with is to distribute your claim codes using the Rewards widget. Just create a Percentage-Off promotion in your Amazon Seller Central account and enter your claim codes into our Rewards widget. Once the user has completed a number of actions defined by you, your claim code will be revealed in the widget. In this case you notice that we have set the product as the final entry method where users can unlock and visit your product listing to redeem their discount. If you have multiple sales channels for your products, it's a good idea to have a mailing list to maintain customer relationships. Since Amazon does not allow you to send marketing-related emails to customers, you can acquire customers externally and thus own the customer relationship. This allows you to further your marketing efforts by sending them your future promotions or potential product launches. Using the discount as incentive, you can have users visit your social media profiles and get to know your brand better. If you are an E-commerce brand with multiple sales channels, this is especially important to help you build your branding. Have a product review or explanatory video you want to share with potential customers? You can have users watch a video on Vimeo or Wistia to get to know your product better before making a purchase. In this example, we also customised the icon to have Amazon's logo and also used Amazon's trademark orange (#ff900) to make it more visually intuitive. If you have an established mailing list or social following, it's a good idea to run flash sales to encourage sales from returning customers. You can distribute secret codes through your established channels and have users unlock your discount with the Secret Code action. You can also use this opportunity to incentivise other actions such as visiting a page - which could be a new blog post, a product launch or something new that you'd like to share with your followers. 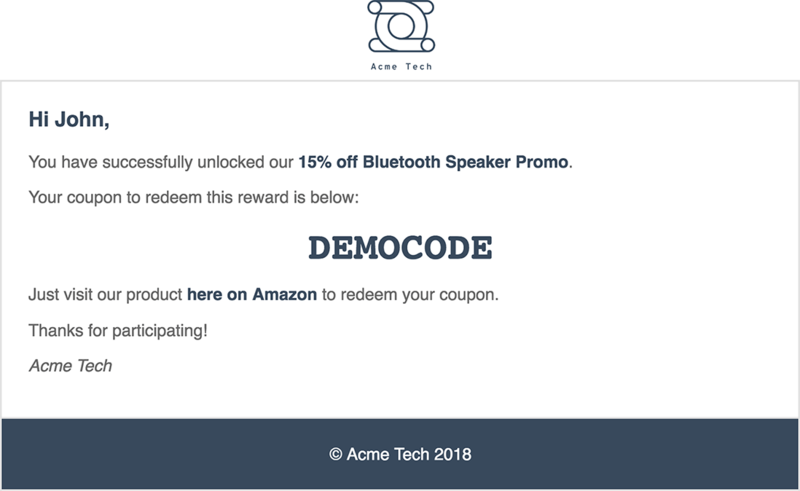 You can share the secret code through your social media channels or by email, just remember to link your Gleam campaign so users know where to redeem your offer! You can learn everything you need to set up your own Coupon Rewards with Gleam right here. If you would like to incentivise a wider array of actions and get more engagement from your customers, you can create a promotion with different tiers of discounts so customers get a higher discount if they engage more with your brand. To create a tiered discount promotion, you need to create multiple promotions in Seller Central and reveal the different claim codes in a series of locked actions. Feel free to be creative here and create different promotions like Buy One, Free One or Free Shipping if you prefer. In the locked action, you will be able to get users to signup for a particular mailing list in which you can mail them the claim code or the Social Media Promo Code link. Remember that you can create more engaging actions such as watching a video, completing a survey or submitting user-generated content as you go further down the discount tiers to make your promotion worthwhile. Learn everything you need to know about creating your own tiered Reward with Gleam right here. As we covered earlier, Social Media Promo Code promotions allow you to offer a discount to your customers through a unique URL. This URL is not available to the public and will not show on your product details on Amazon. The benefit of that is you can control who gets access to the promotion. You can opt to share this link on different social media platforms to measure each platform's performance, or by having an influencer review your product and distributing the unique URL. Using Gleam Rewards, you can gate the promotion and have users engage with your brand before accessing the discount. We recommend using the Redirect Reward to send customers straight to your promotion page. Since your target audience has previously engaged with your brand, you can incentivise actions like answering some questions or completing a survey. If you are distributing this sale to existing customers, it might be a good idea to get users to submit some user-generated content too. You can run a Social Media Promo Code campaign for up to 30 days on Amazon. To ensure your Reward does not stay active after your promotion has expired, remember to set an End Date for your Rewards campaign under the Setup tab. 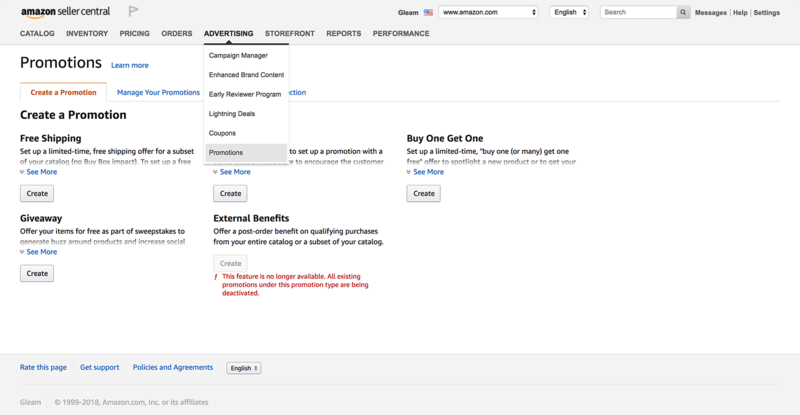 To drive users to your Amazon promotion page, you will need to create a Redirect or Link Reward so that users can access your promotion after they performed your designated actions. If you have a set amount of inventory for this promotion, you can allocate the Number of Claims to the number of products you intend to sell with this promotion. The Gleam widget will automatically disable new user entries once the number of claims has been reached. 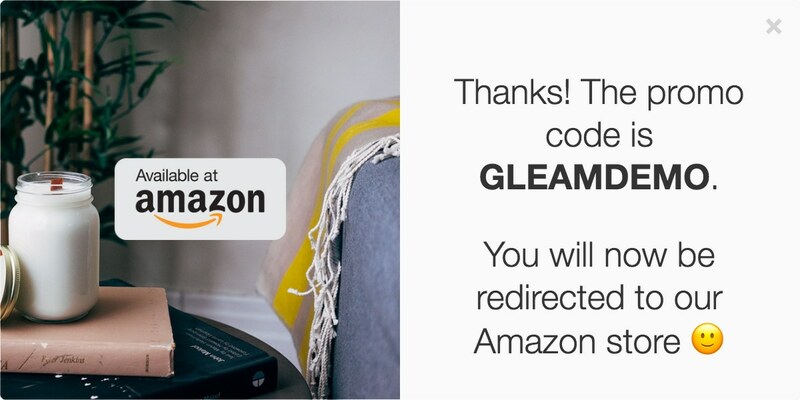 Once you've got the Amazon promotion and Gleam campaign set up, another important element to your Gleam Rewards campaign is how you would go about distributing your claim codes or Social Media Promo Code link. If you are distributing unique single-use codes, make sure you paste all of your comma-separated claim codes into the Code/Link(s) section. The Rewards widget will unlock for each unique code that you enter. For example, if you enter 1000 claim codes, then the Rewards widget will only be able to unlock 1000 times. Each user will receive a unique claim code. You should also set an end date for your promotion by entering an End Date for your Rewards campaign under the Setup tab. This should correspond with when your Amazon promotion expires. Since group claim codes can be used by anyone who has access to it, you can set the Number of Claims in your Reward tab to the number of products you intend to sell in your promotion. This will help limit the number of times your Reward can be unlocked so you don't accidentally sell out your whole inventory. Again, you should set an end date for your promotion by entering an End Date for your Rewards campaign under the Setup tab. This should correspond with when your Amazon promotion expires. If you are distributing a Social Media Promo Code link, you can create a Redirect or Link Reward where the user will be directed to your promotion on Amazon after they complete your actions. Just make sure you tick Capture User Details in the User Details tab so you can capture the customer's email. You will then need to create a Custom Redemption Email in the Post Redeem tab to reveal your claim code or Social Media Promo Code link. You can direct users to your product listing URL in a Visit a Page action. To make sure users can only access the URL once they have completed your actions, you can 'lock' it by setting the Actions Required parameter to the number of actions you require the user to complete. The 'locked' action should also be the last item in your list of actions. In the example above, Actions Required is set to 1. Head to the Rewards tab and set the Reward Type to Redirect. Then, enter your product listing or Social Media Promo Code URL into the Code/Link(s) section. Use the Post Entry Redirect feature to send users to your product listing or your Social Media Promo Code URL. 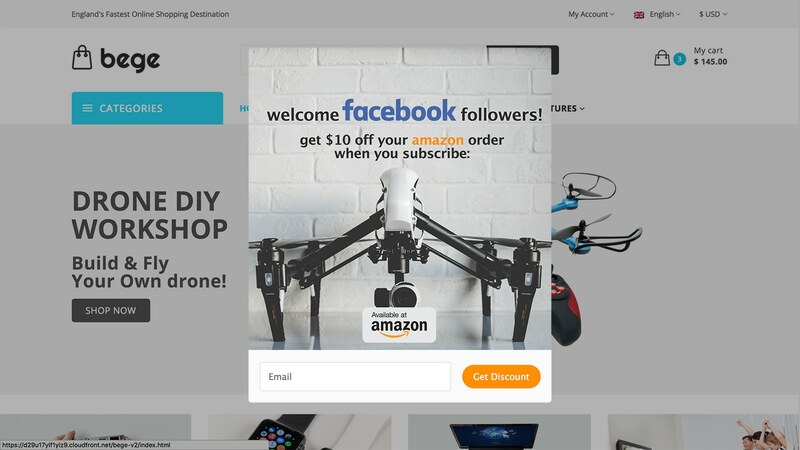 You can direct users to your product listing or Social Media Promo Code URL via a Custom Redemption Email. Head to the Post Redeem tab for Rewards and enable Default Redemption Email or Custom Redemption Email. By default, the URL or claim code from your Code/Link(s) section will be revealed in the email. You can further customise the email by using a Custom Redemption Email instead. Head to the Post Entry tab for Competitions and enable Custom Confirmation Email. Here you can insert your product listing URL. You can host any of the campaigns we mentioned earlier on your website. Gleam makes it easy by allowing you to embed the Gleam widget with just a few lines of code. If you want to drive external traffic to your Amazon product listings, a good way to do that is by creating a reliable sales funnel. Instead of getting users to visit your product listings directly from social media shares, you gain better control of your leads by building an external landing page that will help you capture the user's email and also gain social engagement. Gleam's Hosted Landing Pages are a powerful solution for Amazon sellers who don't have their own website or web store. Using the Competitions or Rewards app you can create marketing campaigns that will help you funnel traffic to your Amazon product listings. Hosted Landing Pages are highly customisable and allows you to feature your logo and branding. For example, you can customise the CSS of the widget, or change the colours for each action to match your branding. You can also change the background image to suit your campaign's theme. Customised Landing Pages are available to users on Pro plan and above. Feature Image Sliders are available to users on Business plan and above. For campaigns like this we generally discourage users to reveal their product listing in the widget because you want to ensure the visitor has purchase intent before landing on your Amazon page. If you get a lot of visitors arriving at your product listing without making a purchase, this could potentially lower your conversion rates thus harming your internal product ranking. To mitigate that, all you have to do is create a Redirect reward where the user will be automatically redirected to your Social Media Promo Code page or product listing after they have shown purchase intent (i.e. performing the actions in your campaign). 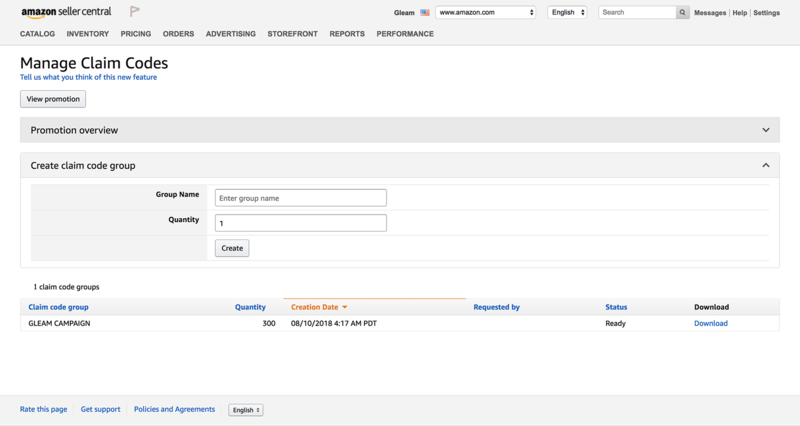 Once you have the campaign setup, there are plenty of ways you can distribute it to start driving leads to your Amazon store. 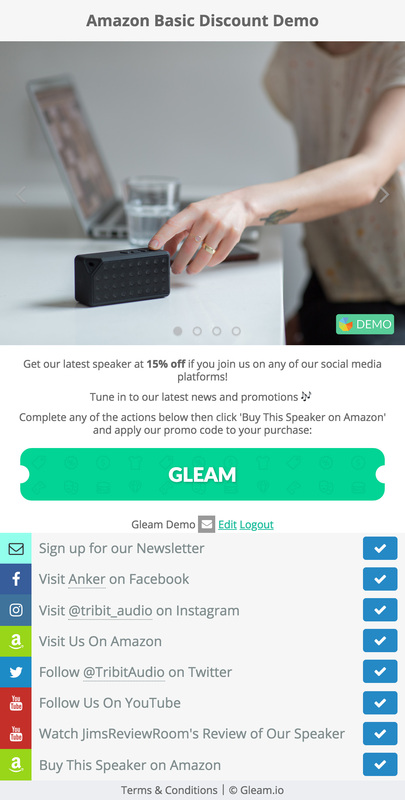 We recommend sharing the hosted landing page generated by Gleam so that you can capture your leads before sending them to your Amazon product listing. Spread the word about your campaign across all of your social media platforms including Facebook, Twitter, Instagram and any other platforms you have an active presence on. Have an influencer promote your campaign through a product review. This could be a YouTube video, an Instagram post, or a blog post. They can then link or embed your campaign on their own web page. Run a Facebook Ad. Facebook has a much larger audience than Amazon and has a powerful audience targeting system you can take advantage of. 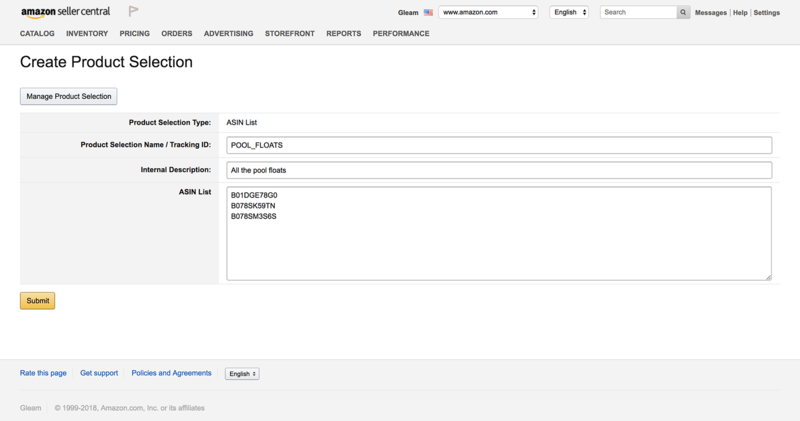 You can run an ad that links users to your Gleam campaign. Running a contest can be a fun way to engage with return customers as well as attract new ones. If you would like to bring more attention to a specific product, while driving sales for another, you can opt to run a contest where a purchase is required for one product, with the prize being another product you want to drive attention to. Just make sure that you have a competent panel of judges who are able to pick a winner! In most countries, you are obliged to create an element of skill in your campaigns should you incentivise purchases. 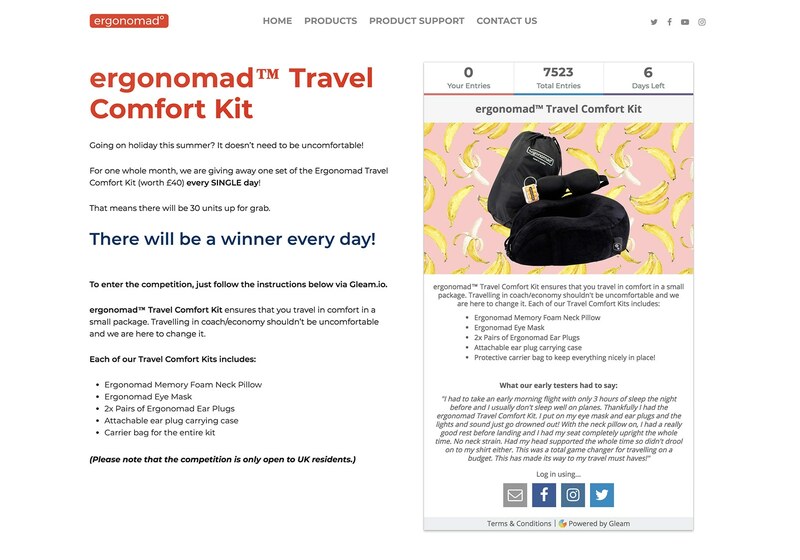 If you would like to increase sales for a specific product, running a contest can be a good way to not only drive sales but also help you collect some user-generated content. For this campaign you will need to focus on incentivising the purchase and the contest entry action. We will not recommend additional actions such as social follows or visiting a website just because it will distract the user from the main goal. Using the Submit Media action, you can have contestants submit their photo from social media or from their own computer. The great thing about photo contests is that you can collect the submissions and re-use the photos in your future marketing efforts. You can also create a Custom action and have contestants enter a caption for a chosen photo. If your target audience is mostly female, you can consider running a Pinterest contest. A 'Create a Pinboard' contest will allow you to get an idea of your target audience's wants or needs by showing you a moodboard of their ideals. If you're considering an even more comprehensive campaign, you can also pair your contest with a discount for all contestants. Using our Competitions app, you can have contestants perform any amount of actions you desire (so long as they portray elements of skill) and they will be able to claim their discount in a custom post entry email. Depending on your preference, you can also export your mailing list and distribute the claim code in your preferred mailing platform. If you are using a Social Media Promo Code instead, you can have users redirected to your promotion page directly with the post entry redirect feature. 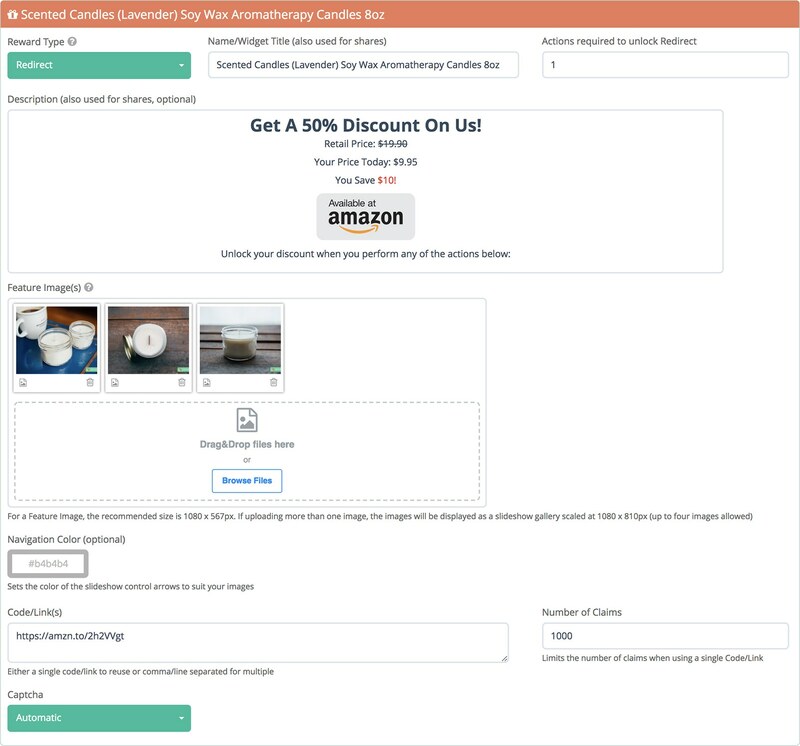 Another approach you can take to pairing your contest with a discount is using our Coupon action to offer a discount code from within the widget. You can use the actions required setting to lock your discount until after a certain number of actions have been completed. This allows you to use a discount to not only incentivise sales, but also encourage users to complete more actions and maximise the effectiveness of your campaign. If you want to drive more external traffic to your Amazon product listings, chances are you've considered hiring an influencer to help spread the word for you. Hosting reviews on YouTube are a popular option considering there are over a billion users on YouTube. Chances are you'll be able to expose your product to a lot of people. To filter out cold traffic, we recommend you or your influencer promote the product via an external landing page. Gleam Competitions and Rewards both come with Hosted Landing Pages which allows you to create a special page catered to distributing your promo codes and also incentivising other actions such as social follows or providing feedback. You can even have influencers distribute free samples of your product using Custom Fields in our widget to collect extra information such as a contact number and delivery address. This page can then be distributed by you or the influencer to ultimately increase product awareness and drive more traffic to your product listings. Gleam Capture boasts powerful behavioural rules meaning you can target the right audience to display your intended message or offer. 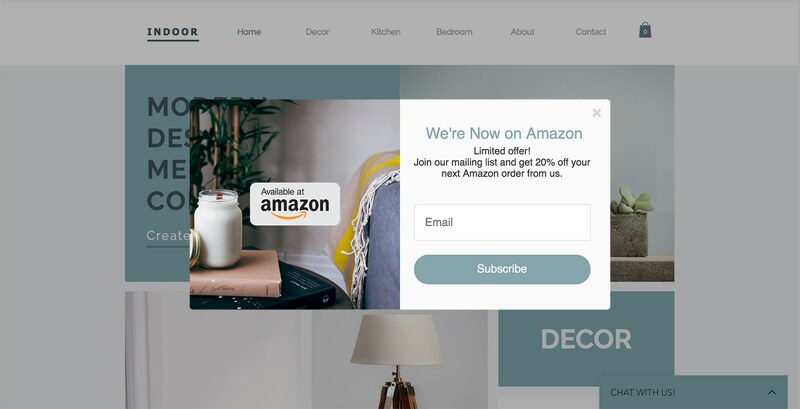 If you have your own website, you can use Capture to build customisable opt-in forms to offer discounts, grow your mailing list and drive traffic to your Amazon store. If you would like to make an announcement for your Amazon store, we recommend creating a Popup or Bar Capture where you can display the announcement to visitors. The Popup template also allows you to redirect visitors directly to a specific URL once they have subscribed. You can use this to redirect users to either your Amazon product listing page or Social Media Promo Code page. For more specific targeting, you can also setup a behavioural rule where only new visitors from a specific location can access your offer.